PM Update, February 20: Today's high and low, if it holds through midnight, have already exceeded Sunday's forecast by 2° each. Along with upwardly revised forecasts for the rest of the week (including 68° on Thursday), the projected winter average is now slightly edging out 2002 for sole possession of 3rd place. As noted earlier, Washington has been having an exceptionally warm winter. Temperatures in the past week have confirmed that trend, consistently outperforming even above-average forecasts. This excess culminated on Saturday, when the high of 59°, exceeded the extended forecast by 9°. Although today's high of 45° was well below Monday's National Weather Service forecast of 51°, it was also well above the forecast of upper 30s made less than 24 hours in advance. Altogether, the week's daily highs averaged 3.3° above the temperatures forecast last Monday. 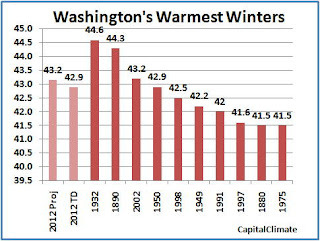 The winter average temperature to date now stands at 42.9°, tied with 1950 for 4th warmest in Washington climate history. Projecting forward using the forecast for the next week, the temperature will have to average just 3° above normal for the last 3 days of the month in order for the winter to tie with 2002 for 3rd place. 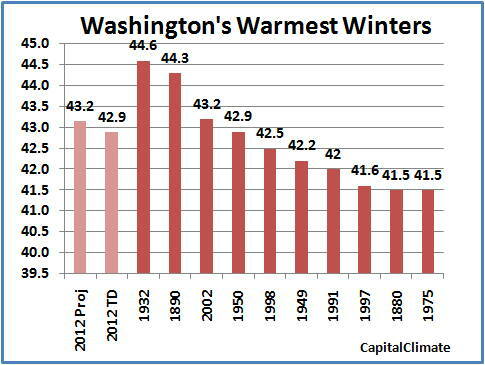 Regardless of the exact final result, it's likely that 2 of the 4 warmest Washington winters will have occurred in the last 11 years.